Wandering the English countryside, complete with ghosts! Ah, England! It’s quaint, cultured, and old. Oh, wait, I’m describing English tourists. We have been touring what appears to be the English countryside’s greatest hits, and I am struck by two things. First, the tourists are overwhelmingly English folks exploring their own country, which I think is charming. Second, they are pretty old. I’m not kidding. Wherever we go, we are surrounded by exceedingly old English people. We have also seen surprisingly few foreign tourists. Part of this may be that we’re traveling when kids are in school, but it may just be that older English people like to get out and about. I will also say that they like to eat. I don’t recommend getting between a pensioner and the breakfast buffet. I’d rather get between a lion cub and its mother. Our first stop in England was Stratford upon Avon. Who could resist wandering the same streets where Shakespeare created all that greatness? It’s not hard to do a walking Shakespeare tour. There are famous sites everywhere – here’s where Shakespeare was born, here’s his school, here’s his grave, here’s his house, here’s his father’s house. 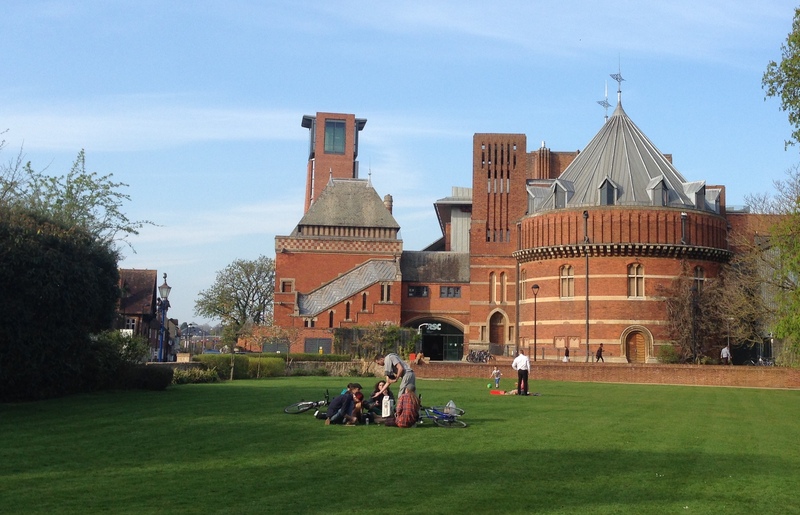 And of course, the Royal Shakespeare Company calls Stratford home. And so what did we see on William Shakespeare’s home court? Um, Death of a Salesman. Yep. In our defense, that’s what was playing. Also, Willy Loman was played by the great British actor, Sir Antony Sher, and he was brilliant. It’s getting a little embarrassing. We’ve seen the Sydney Theatre Company do Suddenly Last Summer, a production of Sweet Charity in Melbourne, and now RSC doing Salesman. They’ve all been very good (well, Sweet Charity was kind of meh), although the accents are all over the place, unsurprisingly. The Royal Shakespeare Company in Stratford upon Avon, where we saw that great Shakespeare play, Death of a Salesman. Next on our tour of Old England was an impossibly quaint little town in the Peak District, Derbyshire. We had a drink at the Cheshire Cheese Pub. How British is that? There is a cavern in town called the Peak Cavern, but it is known popularly as the Devil’s Arse, because of the noises the cave makes when water drains out of it. One of my enduring sadnesses is that they didn’t name a pub after it. How could you pass up a drink at the Devil’s Arse? Sadly, nobody has seen the great marketing potential. Castleton is about a thousand years old, and sits at the foot of, you guessed it, an old castle, which was worth a scamper. I don’t know why I’m so fascinated by castles, but there’s something about poking around the grounds of a Monty Python set that makes me smile. 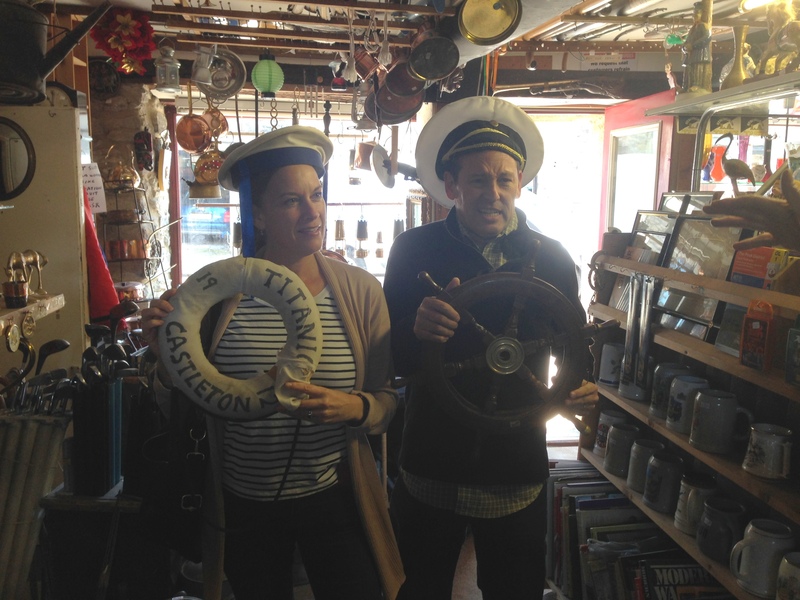 Another highlight was the town’s junk shop, in which the proprietor, whom we’ll refer to as eccentric, heard our American accents, at which point he switched on the theme from Titanic and plopped a captain’s hat on me and some other hat on Janine. Wasn’t the Titanic a British ship with a British captain? I half expected the guy to offer condolences that the American colonies lost the Revolutionary War. No matter, he was a spunky, funny guy, and I didn’t want to ruin his good time. In the junk shop of the “eccentric” fellow in Castleton. Unclear on the concept, I’m growling like a pirate. We seem to have finally found the season we’ve been looking for. The English spring has sprung. Trees are leafing out all over and the fields of blooming rapeseed (from which canola oil, bio-diesel, and for all I know, car parts are made) look like a Van Gogh painting. 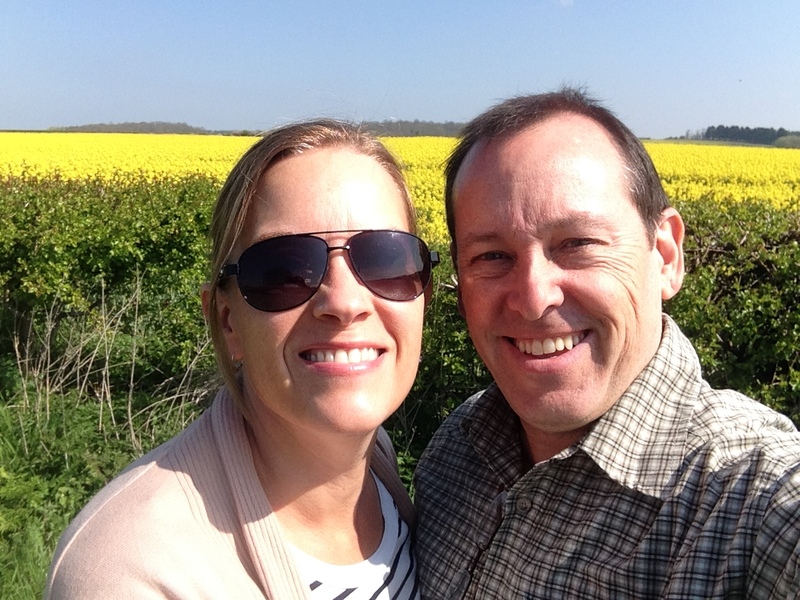 The loving couple next to the yellow field. When we left Castleton, we pushed north toward the Dales, stopping at a slightly kooky pub/motel at the southern entrance to Yorkshire Dales national park. The rooms are a little goofy – the proprietors of the establishment have managed to take a two hundred year old stable and turn it into a seventies-style motel. The pub more or less has the old world charm one expects from a pub in the English countryside, but I confess that the room reminded me of a motor inn on the outskirts of Reno. What we didn’t see in that Nevadan motel was a ghost. Now, I don’t believe in ghosts. I don’t believe in magic, or dragons, or the Loch Ness monster, or that we’ll ever have a functional Congress, and I have my doubts that the Mets will ever again make the playoffs, despite their great start this year (oh hallelujah for the internet, which allows me to watch baseball from afar!). Janine doesn’t believe in ghosts either, although that was put to the test yesterday. She woke up in the middle of the night and saw what appeared to be a small figure moving across the room. Without giving anything away, we asked the owner whether people ever reported seeing ghosts, and he said that customers often say they’ve seen the ghost of a young girl in the building our room was in. Of course, if I owned a pub I’d spread stories about ghosts too, so I take that with a medium sized hunk of salt, but still, the whole thing was freaky. British inns with ghosts! Now’s we’re cooking with gas! 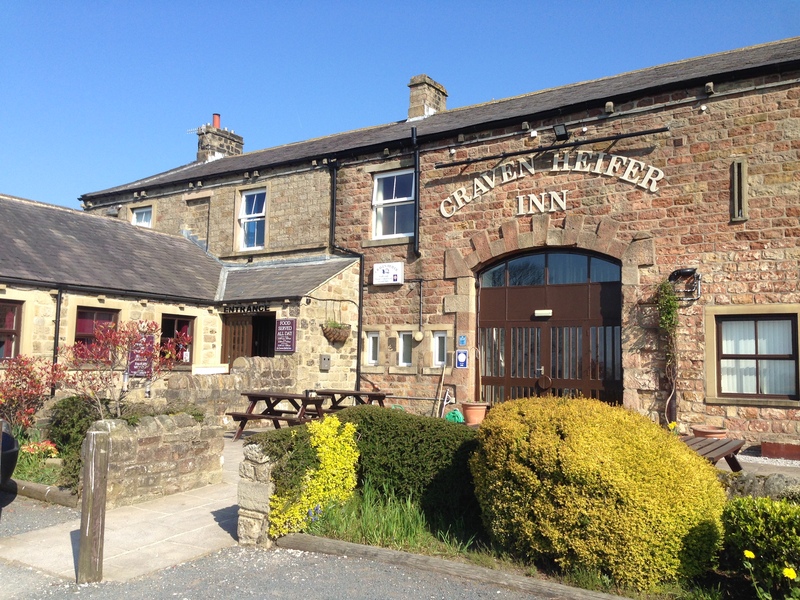 The Craven Heifer, where Janine saw the ghost. The next day we made our way through the Yorkshire Dales – a collection of hills and river valleys in central England. Quite simply, it’s one of the most beautiful bits of countryside I’ve ever seen. There are miles upon miles of tidy little fields bordered by ancient stone walls and filled with bleating sheep. The sun was shining, the clouds were white and fluffy, and the cute little spring lambs romped in the fields with abandon. It was slow going, since the stone-lined roads regularly narrow to a single skinny lane, but the journey should be taken slowly anyway. The Yorkshire Dales. I can’t imagine how many people hours went into hauling all the stones out of the fields and making houses and fences out of them. It was just achingly beautiful, and if you like narrow country roads and sheep and old stone houses and such you just have to go. If you removed the modern vehicles, I suspect that this series of valleys look just as they did hundreds of years ago. Ghosts, Devil’s bottoms, stone walls…England is fun! Maybe my favorite post —— !! On your way to Cumbria? It’s incredibly beautiful there, and in the Lake District, too. There is a town called Cockermouth (seriously!) where Wordsworth is from. Take the brewery tour. Loved this last post, Eric. Love to Janine. Who does not believe in Magic? How about visiting an opera house and feeling like Wolfgang Amadeus himself? How about visiting a castle and feeling like Sir Balian of Ibelin in Kingdom of Heaven? How about seeing a green lawn? Is that magic or wonder? I definitely believe in wonder, but I’m iffy on ghosts.